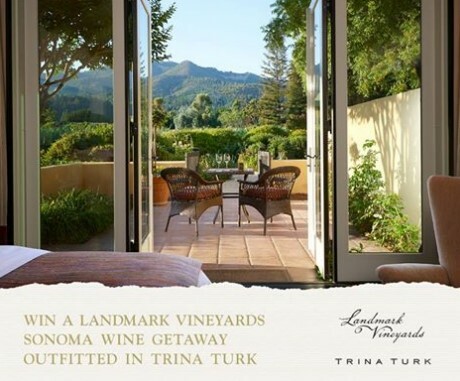 Landmark Vineyards has teamed up with designer Trina Turk to give away a relaxing trip for two to Landmark Vineyards, complete with Trina Turk fashion apparel included! Grand Prize: (i) round-trip economy class air transportation (air carrier to be designated by Sponsor) between a major airport near Grand Prize Winner's residence and San Francisco International Airport for Grand Prize Winner and a guest (up to a maximum approximate retail value ("ARV") of: US $1,000); (ii) two (2) nights stay in a Guest Suite at Landmark Vineyards in Kenwood, California (exact accommodations to be determined by Sponsor’s at its sole discretion) (ARV: US $600); (iii) one (1) exclusive winery experience at Landmark Vineyards for Grand Prize Winner and a guest (ARV: US $80); and (iv) Trina Turk wardrobe for two (2) people (exact clothing items and style to be determined by Trina Turk in its sole discretion and subject to availability) (ARV: US $1,000). The total ARV of the Grand Prize is US $2,680. This Sweepstakes ends on 06/03/16 and you can ENTER ONCE to win.